Extracts photos from iPhoto library. 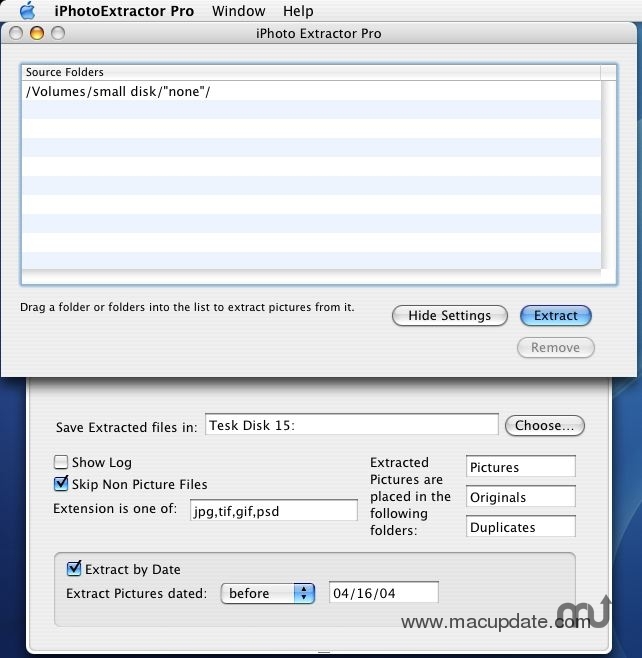 Is there a better alternative to iPhoto Extractor? Is iPhoto Extractor really the best app in File Management category? Will iPhoto Extractor work good on macOS 10.13.4? "A friend had her iPhoto Library "disappear" on her one day, such that iPhoto showed no pictures, but the files were all still tucked away in the iPhoto library structure. We couldn't seem to rebuild the library without importing everything back into iPhoto and manually weeding through the "thumbnails" and "altered" files created by iPhoto. iPhoto Extractor needs a rating. Be the first to rate this app and get the discussion started! "Thus iPhoto Extractor was born. It's function is simple, traverse the iPhoto library structure, copying the target files into a sorted destination. This way you can import all or some of your files back into iPhoto and not worry about thumbnails and other files you would have to manage manually. "The download package has 2 files. An AppleScript droplet that you can run in any version of the Mac OS (9->10.2.x) and a "Pro" version that is a Mac OS X application that runs in Mac OS X 10.3.x or higher. Check out the READ ME for more information on which to use and why."